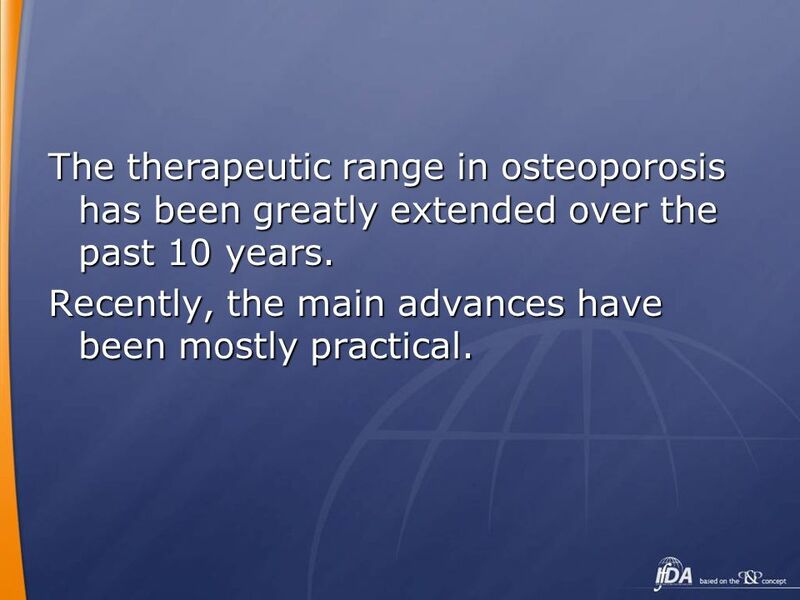 2 The therapeutic range in osteoporosis has been greatly extended over the past 10 years. Recently, the main advances have been mostly practical. 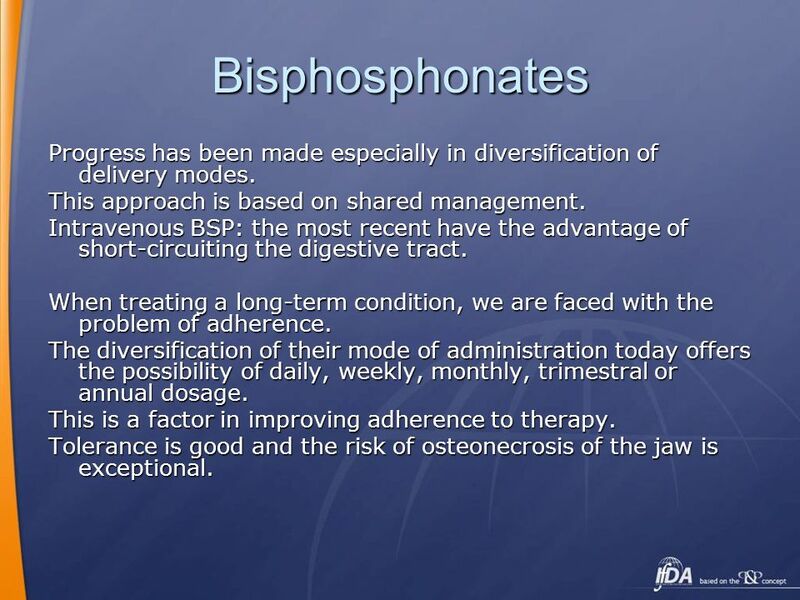 3 Bisphosphonates Progress has been made especially in diversification of delivery modes. This approach is based on shared management. Intravenous BSP: the most recent have the advantage of short-circuiting the digestive tract. 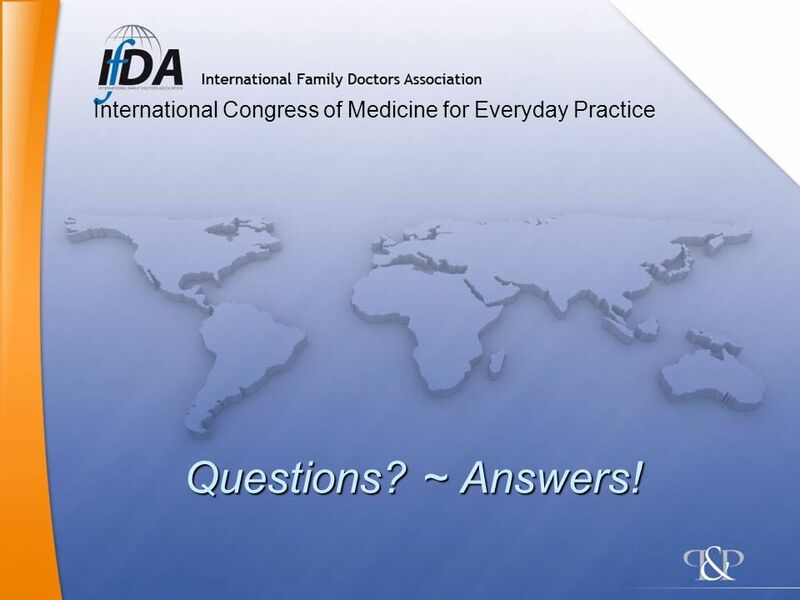 When treating a long-term condition, we are faced with the problem of adherence. The diversification of their mode of administration today offers the possibility of daily, weekly, monthly, trimestral or annual dosage. This is a factor in improving adherence to therapy. Tolerance is good and the risk of osteonecrosis of the jaw is exceptional. 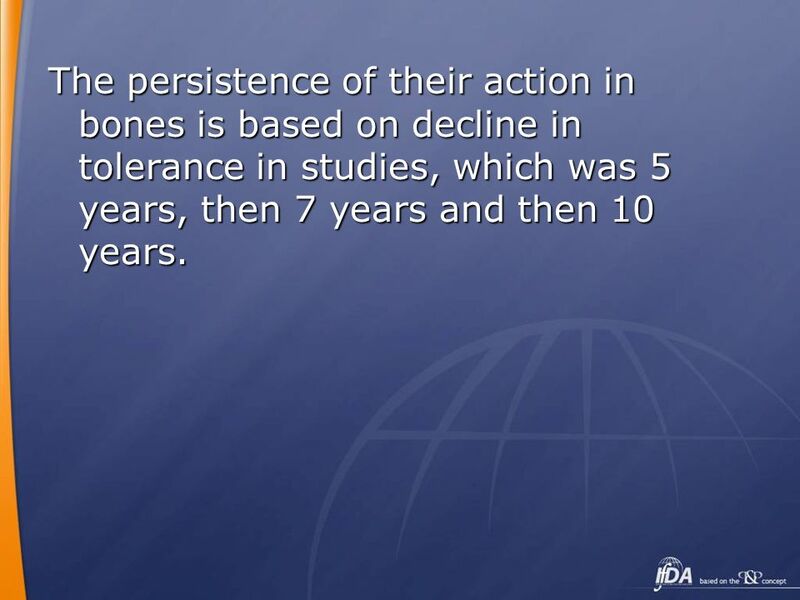 4 The persistence of their action in bones is based on decline in tolerance in studies, which was 5 years, then 7 years and then 10 years. in spite of the side effects: Cramps and hot flushes It is prescribed for a reason: It reduces the risk of vertebral fractures in women between the ages of 60 and 70. Treatment may last as long as 10 years, particularly in women treated before the age of 60. 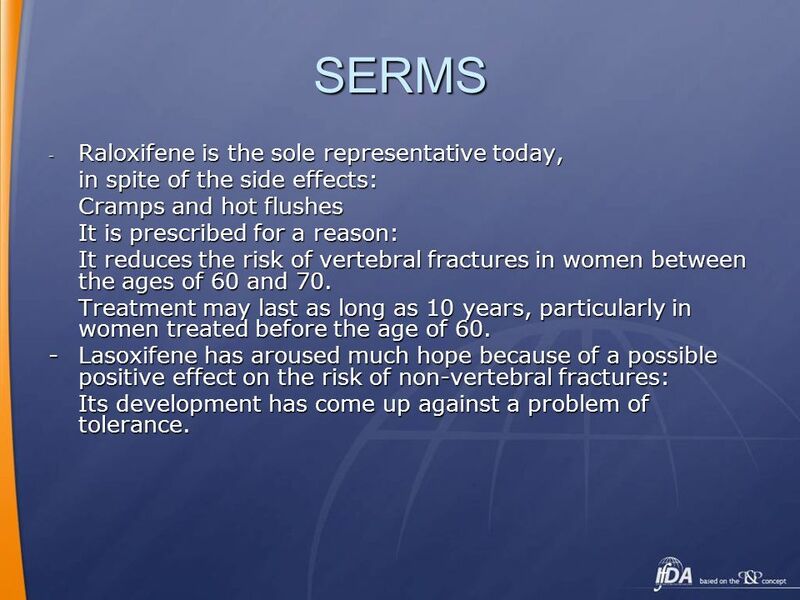 -	Lasoxifene has aroused much hope because of a possible positive effect on the risk of non-vertebral fractures: Its development has come up against a problem of tolerance. 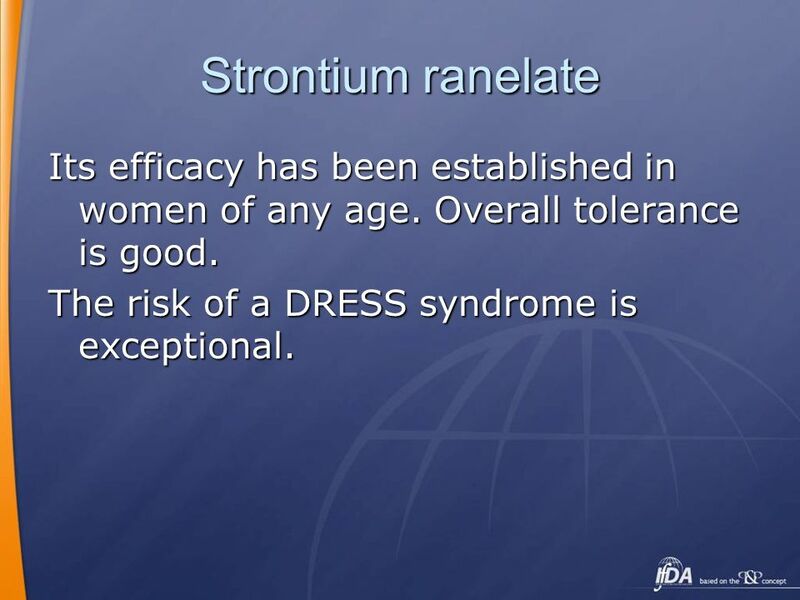 6 Strontium ranelate Its efficacy has been established in women of any age. Overall tolerance is good. The risk of a DRESS syndrome is exceptional. 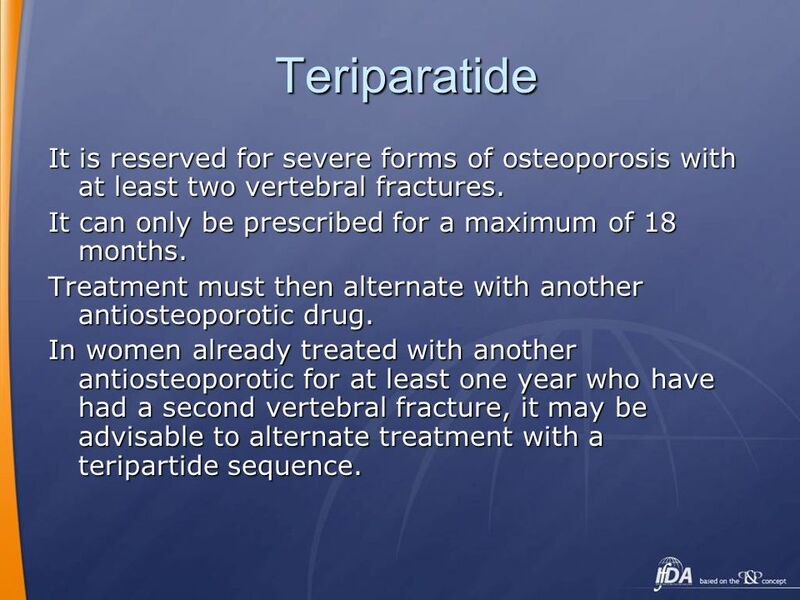 7 Teriparatide It is reserved for severe forms of osteoporosis with at least two vertebral fractures. It can only be prescribed for a maximum of 18 months. Treatment must then alternate with another antiosteoporotic drug. In women already treated with another antiosteoporotic for at least one year who have had a second vertebral fracture, it may be advisable to alternate treatment with a teripartide sequence. It neutralizes RANKL, which plays a key role in osteoclast differentiation. 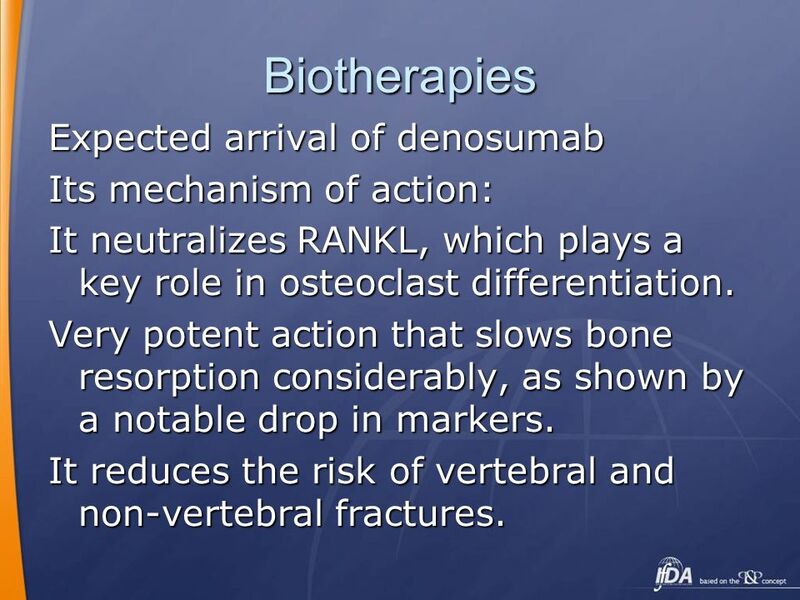 Very potent action that slows bone resorption considerably, as shown by a notable drop in markers. It reduces the risk of vertebral and non-vertebral fractures. Remodeling then resumes and bone mineral density diminishes. It will be delivered via a subcutaneous injection every 6 months. It could be a first-line or second-line treatment, after BSPs. Its tolerance seems very encouraging. Enzyme involved in bone resorption. 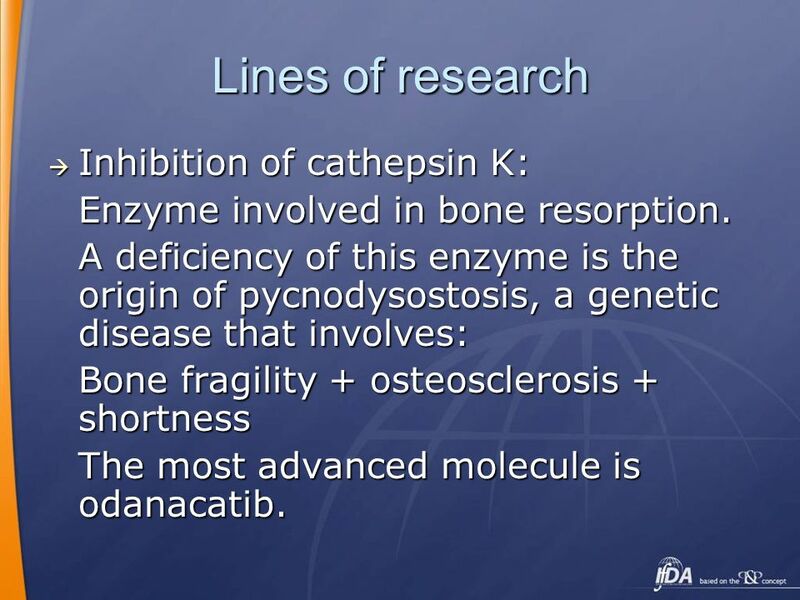 A deficiency of this enzyme is the origin of pycnodysostosis, a genetic disease that involves: Bone fragility + osteosclerosis + shortness The most advanced molecule is odanacatib. Molecule that slows osteoblast activity. 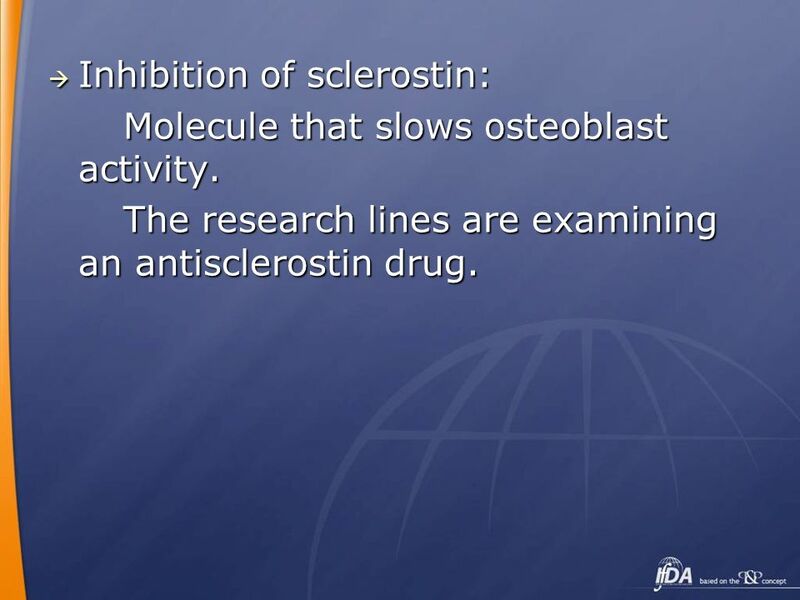 The research lines are examining an antisclerostin drug. Activin A is a member of the TGF-β family. Activin A is found in abundance in bone. The inhibition of activin could stimulate osteoblastic bone formation and reduce osteoclastic bone resorption. ACE-011 is an activin type IIA fusion protein. 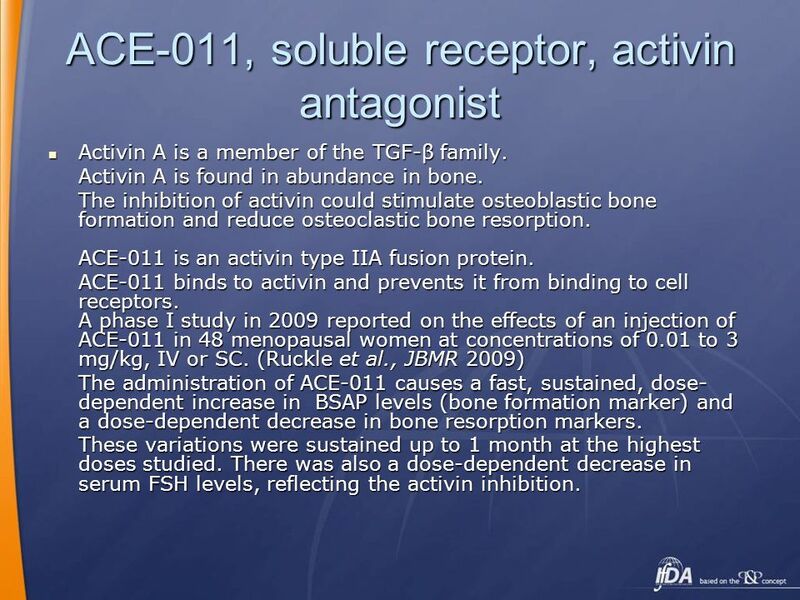 ACE-011 binds to activin and prevents it from binding to cell receptors. A phase I study in 2009 reported on the effects of an injection of ACE-011 in 48 menopausal women at concentrations of 0.01 to 3 mg/kg, IV or SC. (Ruckle et al., JBMR 2009) The administration of ACE-011 causes a fast, sustained, dose-dependent increase in BSAP levels (bone formation marker) and a dose-dependent decrease in bone resorption markers. These variations were sustained up to 1 month at the highest doses studied. There was also a dose-dependent decrease in serum FSH levels, reflecting the activin inhibition. 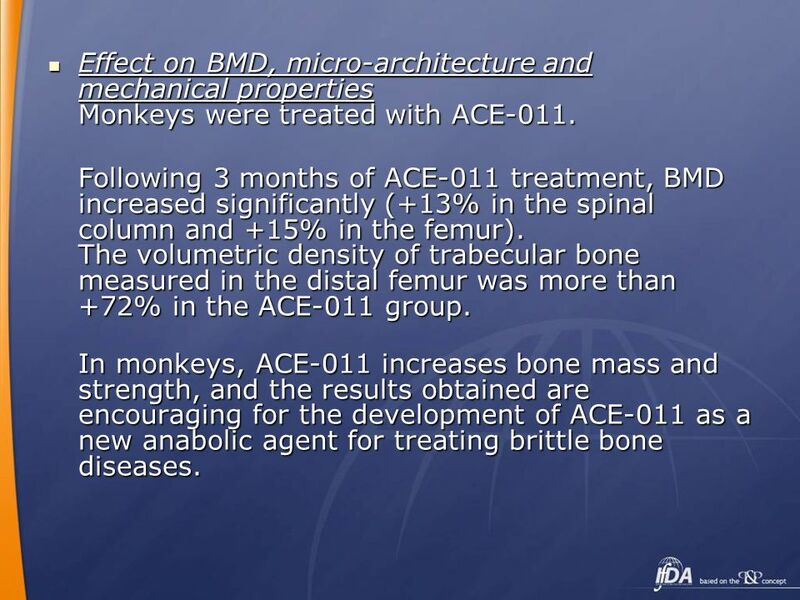 13 Effect on BMD, micro-architecture and mechanical properties Monkeys were treated with ACE-011. Following 3 months of ACE-011 treatment, BMD increased significantly (+13% in the spinal column and +15% in the femur). The volumetric density of trabecular bone measured in the distal femur was more than +72% in the ACE-011 group. In monkeys, ACE-011 increases bone mass and strength, and the results obtained are encouraging for the development of ACE-011 as a new anabolic agent for treating brittle bone diseases. Recent studies (Yadav et al., Cell 2008) have highlighted the relation between intestinal serotonin production and the deleterious effect of serotonin on bone mass. Serotonin (5-hydroxy-tryptophane, or 5-HT) is a neurotransmitter with numerous receptors in bone. Most serotonin (95%) is produced in the duodenum by the action of tryptophane-hydroxylase (Tph-1). 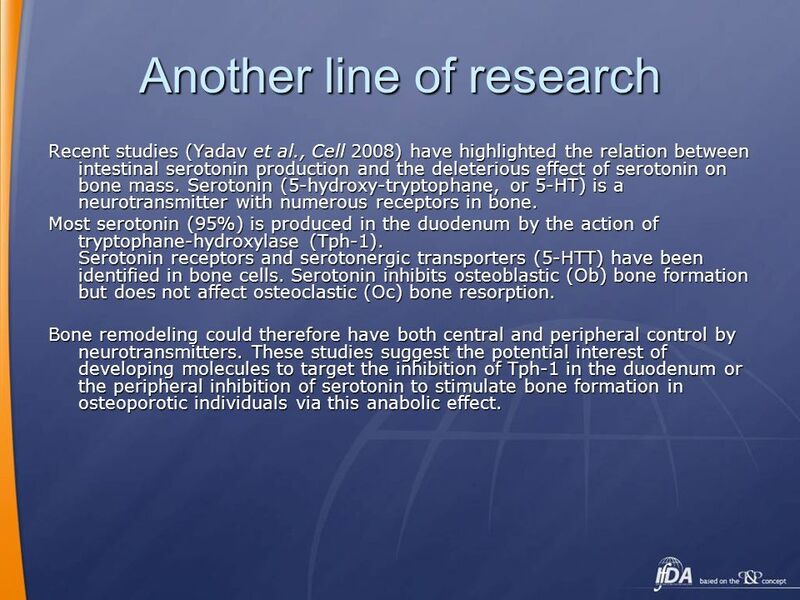 Serotonin receptors and serotonergic transporters (5-HTT) have been identified in bone cells. 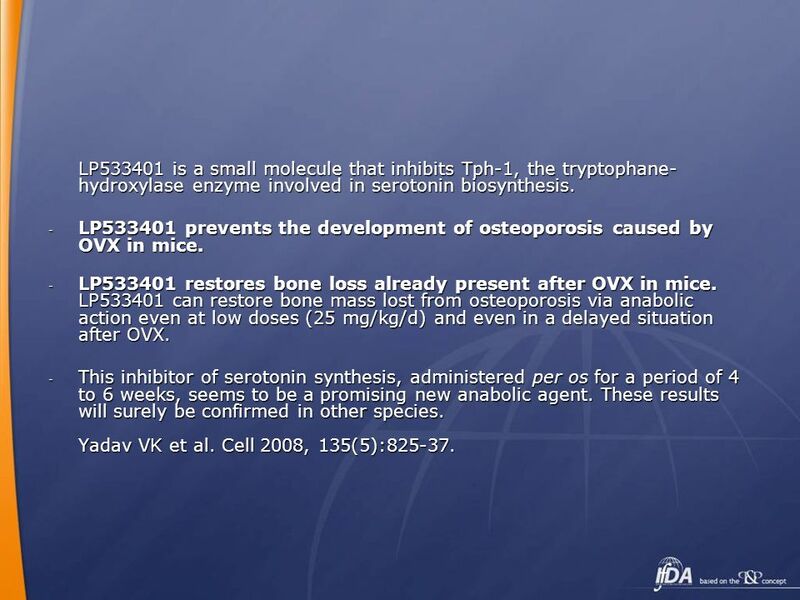 Serotonin inhibits osteoblastic (Ob) bone formation but does not affect osteoclastic (Oc) bone resorption. Bone remodeling could therefore have both central and peripheral control by neurotransmitters. These studies suggest the potential interest of developing molecules to target the inhibition of Tph-1 in the duodenum or the peripheral inhibition of serotonin to stimulate bone formation in osteoporotic individuals via this anabolic effect. 16 The WNT/LRP5 pathway Interest in this pathway and its involvement in developing new therapeutic agents: Mutations of LRP5 cause either a loss or a gain in the function of the protein coded by this gene. A loss of function is associated with juvenile osteoporosis, while a gain in function leads to highly increased bone mass. Recent studies have shown that LRP5 is involved in the regulation of osteoblast proliferation and activity. 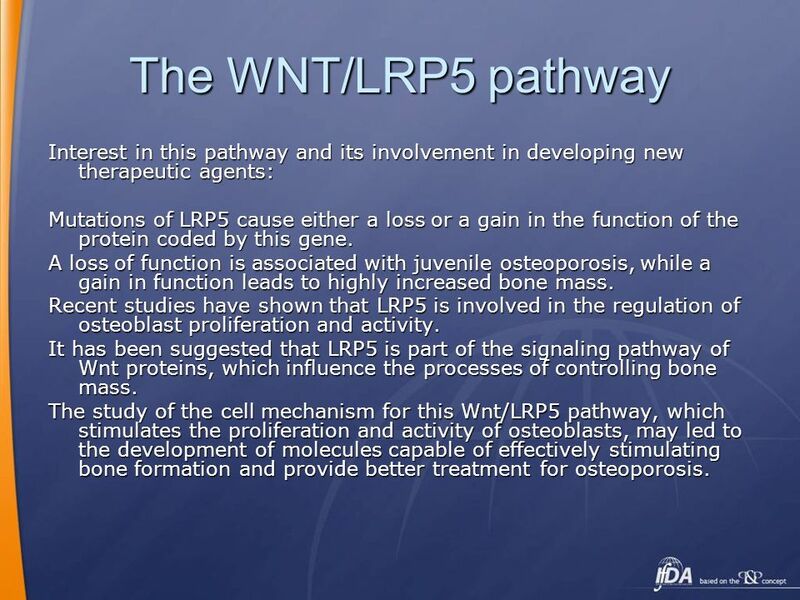 It has been suggested that LRP5 is part of the signaling pathway of Wnt proteins, which influence the processes of controlling bone mass. The study of the cell mechanism for this Wnt/LRP5 pathway, which stimulates the proliferation and activity of osteoblasts, may led to the development of molecules capable of effectively stimulating bone formation and provide better treatment for osteoporosis. 17 CONCLUSION Beyond the quantitative aspect, bone quality is a crucial parameter that must be taken into consideration in treating osteoporosis. 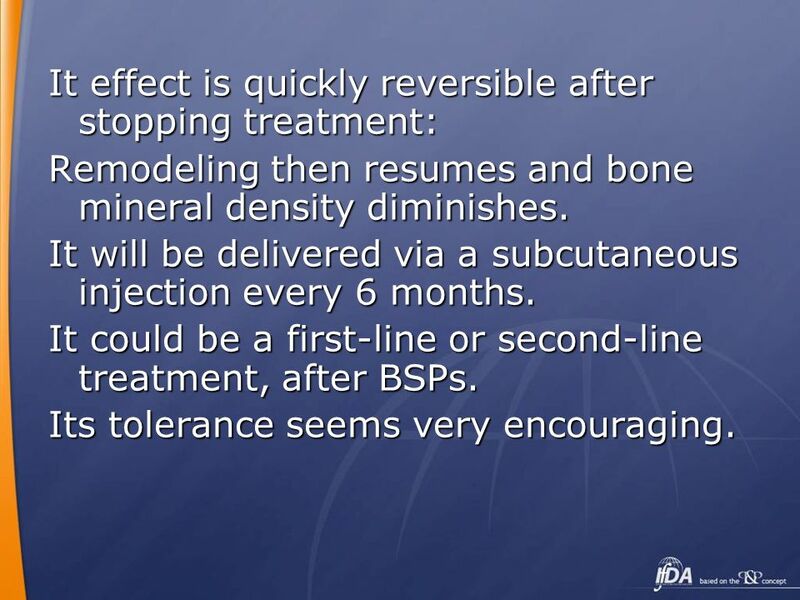 Different lines of therapeutic research focus on this objective, which is essential in resistance to bone fractures. 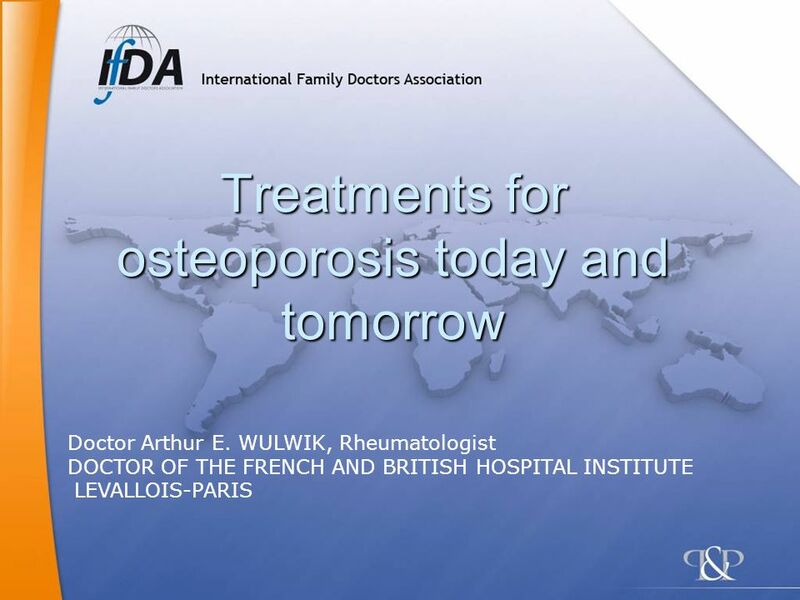 Download ppt "Treatments for osteoporosis today and tomorrow"
How Should We Monitor, Prevent, and Treat Osteoporosis in IBD? All of Our IBD Patients are at Risk and Therefore all Should Begin Treatment at Diagnosis. Pathogenesis of Antiphospholipid Antibodies in Pregnancy. 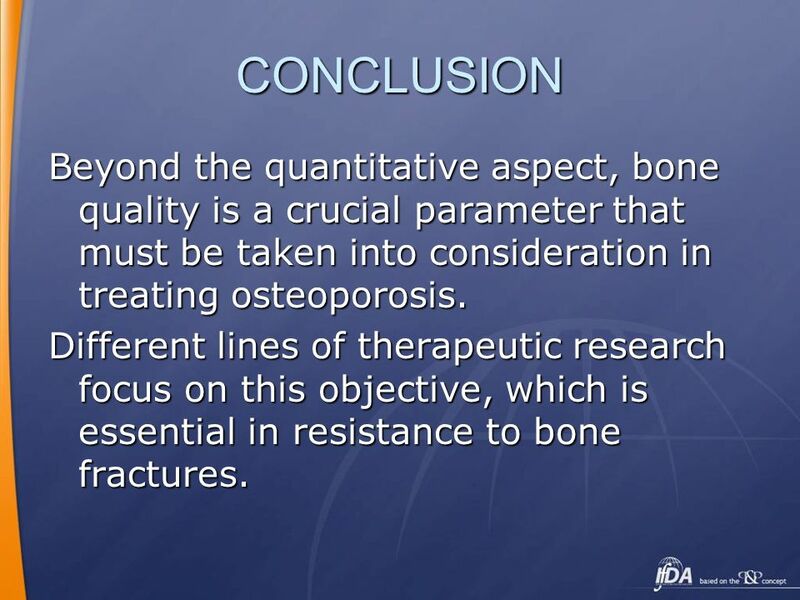 Bone Quality PART 3 Collagen/Mineral Matrix Conclusions Supplemental Slides. Aging of the Skeleton: Osteoporosis An Evolutionary and Biocultural Perspective. Characterizing the Skeletal Phenotype of db/db Mice Student: Bailey Lindenmaier Mentors: Dr. Russell Turner & Dr. Urszula Iwaniec Skeletal Biology Lab. KRAS testing in colorectal cancer: an overview. 2 What is KRAS? KRAS is a gene that encodes one of the proteins in the epidermal growth factor receptor. Bones, Calcium, and Osteoporosis. Bone Bone is living, constantly remodeled Reservoir of Calcium – Calcium levels of blood take precedence over bone levels. Osteoporosis UBC Internal Medicine Program Dr. Mark Fok Dr. Maria Ashley. OSTEOPOROSIS and fracture risk Prof. J. Preželj KO za endokrinologijo, diabetes in presnovne bolezni.